Hi everyone, Darcy here. It has been crazy busy for me just recently. I have been working behind the scenes with Gillian to bring you all these new and fantastic blog posts. I have also been working on my new stamp collection and samples. Today I will show you some of my new stamps in action on a journal page. As a new feature on the blog I will be bringing you a journal page each month, showcasing new products and exploring lots of techniques. 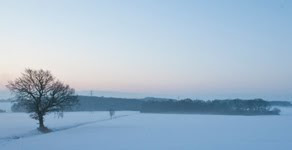 I would love it if you could play along, and explore these ideas with me, and share with the link tool at the foot of this post how you have explored this month's ideas. So you can prepare, I shall tell you in advance roughly what products I plan to use. Also this challenge will remain open for a whole month, so you have plenty of time to join in. Each month I will be using this square sketchbook. Of course you can use any size that you feel comfortable with, but I can personally recommend these books as the paper is ideal for wet media. So without further ado here is my first journal page. I began with masking tape. I used a wide tape so that I could rip the edges and make it rough, I did not want straight edges. This tape is very grabby, and if you stick it straight to paper it will rip the paper when peeled off. To avoid this you need to de-stick the tape by patting it on your clothes a few times. I added a few strips in a random grid. You can see I only used the central part of the pages. I carefully peeled off the tape and left the paste to dry. Now to add some layers of paint. This might seem excessive, in all I used 14 layers, but you need the many layers to add as much interest as possible once you start sanding back. My first layer was to completely cover the page with brushed on Space Cadet, this was dried, and then a layer of Snowflake was applied with a brayer. The next 2 layers are firstly Sage and Green Olives brushed on, and then another layer of Snowflake is brayered on. Then I added some bright colours, choose this layer carefully as this will be the main colour that shows through. I used Pumpkin Soup, Autumn Fire and Claret, these were brushed on and then a final layer was applied with a brayer. The final layer is neutrals, a lot of this layer will disappear but small amounts will remain so it is important that they are neutral. I used Nougat and Mocha Mousse. Let all layers dry between applications. Here is half the page done, you can see the transformation on the right side. The photo cannot show you just how scrummy the middle/grunge paste areas are. But they feel wonderful to the touch. Grunge paste sands back beautifully to a really smooth finish while still retaining the texture. Just look how using the stencil as a rubbing, underneath the page is so effective. Here you can now see all the colours from all the layers. The whole page now looks like a wall in a roman villa, with those warm oranges. The raised tiles in the centre are like bits of old broken moasic. Now to add the focal images, i wanted to use the idea of a little girl, holding a bunch of flowers and letting them blow away with the wind. 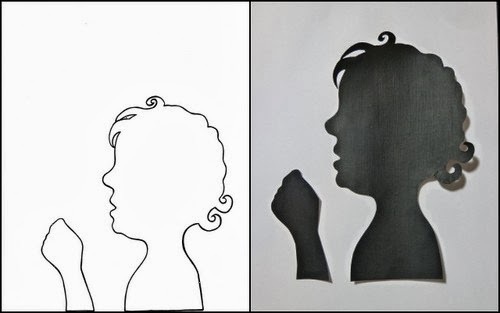 I drew this head and hand, cut them out and then filled in both with black. You could use black gesso or Little Black Dress. 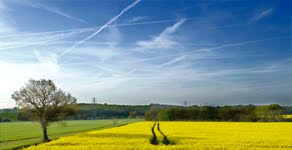 If you would like to play along, you can download this image from THIS LINK. Before I could stick her in, I needed to get the placement of my border. I inked up one of the borders( new stamp alert ) and using black Archival ink I stamped the border all around both halves. Because this border stamp has fiddly bits I knew i couldn't cut the whole thing out. so I stamped again onto smooth paper, coloured in the blocky parts and cut those out. I used Hey pesto, Green Olives,Limelight, Beach hut and South Pacific. Once stuck in place you get the fiddly bits from the lower stamping matching up with the cut out painted bits. The 2 pieces of the silhouette were glued in just behind the border. I know painting faces can be daunting for a lot of people, which is why I have left her as a silhouette, but she does need a little colour. 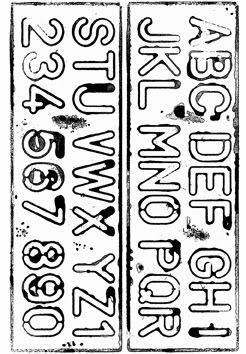 Here is a nifty technique for colouring in stamps that are small and detailed. Not everyone loves painting details with a one hair brush, and some people may be put off using intricate stamps. But if you paint the background first then the job is almost all done for you. I randomly painted this piece with Pumpkin Soup and Autumn Fire, dried it then added Snowflake with a textured brayer. 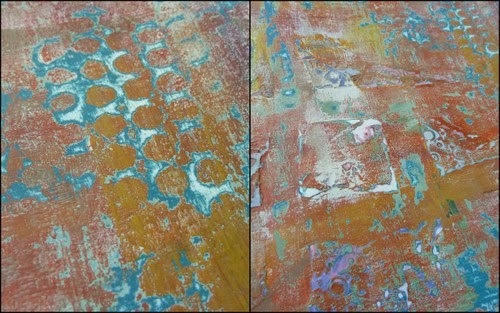 Then I stamped my images (new stamp alert)and just dabbed on some contrastng colours into the spots. I cut these out, turned them over and using an embossing tool over a mouse mat, I made them slightly domed. They were then totally perfect as centres for these fabby prima flowers. You get gazillions of them in a tube, well ok maybe not gazillions but you do get lots and lots, enough to keep you going for ages. Really they are such good value. I glued on the flowers with glossy accents and added my favourite decoration... white dots. Now for another stamp,(new stamp alert) that is too fiddly to colour in. I stamped it onto the page to get the frame in place, then I blobbed lots of colours together and let them dry. This is a great way to add patterning to an image that you could not do by colouring it in with a brush or pen. I stamped the hanging basket of cog-flowers, and the small heart onto my painted paper, cut them out and glued them to the stamped frame. Now to add lots of flowers, in the girl's hand and blowing across the page. These flowers were all coloured the same way, by stamping onto a painted/stencilled background, cutting out and gluing into place. You can see I also mixed in more of the Prima flowers. 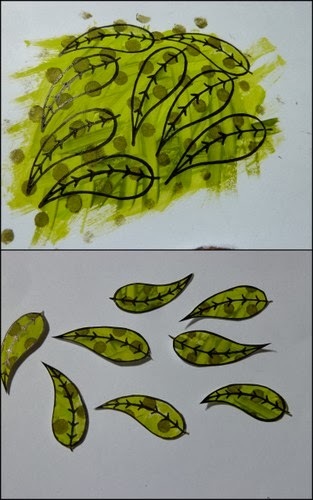 Here are the leaves (new stamp alert) being made, I painted Limelight and Hey pesto, let that dry and then I stencilled with Green Olives, using the same stencil that is in the background layer. It really is such a simple way of decorating stamped images. I continued adding flowers blowing away from the girl, more stamped images (new stamp alert) and more prima flowers. My final addition was some text (new stamp alert) I painted Space Cadet, Pea Coat and Limelight onto Smoothy card. then I stamped the quote using Snowflake. I cut this out and glued it to the page,then using the side of an old credit card and more snowflake, I added some lines around the text. One final photo. To finish off the edges of the pages I rubbed on a little blue and purple from my Portfolio pastels. This is important to frame your piece and to 'ground' it in place, otherwise it looks unfinished and almost like it might slide off the page. 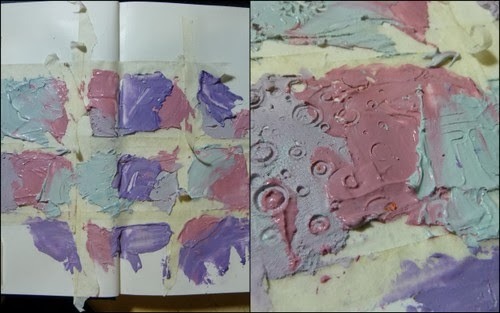 I hope you enjoyed seeing this process, and I would love to see you using some of the techniques, why not grab a journal and join me each month as we fill our books with stamps,colours and techniques. The plan is to use similar products for 2 months and then change, so if you gather supplies to make this page then keep them handy for next month too. All the new stamps that I used will be available to buy from the official launch at the Stevenage show on Feb 9th, where I will be demoing.They will be available to trade customers from the start of February and so available in your LSS from February onwards. If you would like to join in then please link up how you were inspired by the techniques presented above using the linky below (this is a separate link to the weekly PA challenges). This journal challenge will remain open for a whole month, and will end the day before my next journal page. Please follow the guidelines below, and enter your journal page to be in with a chance of winning one of my brand new stamp plates. Make sure you have your journal page entry linked up by 5pm (London time) February 21st 2014. Dang, by far the best thing I have seen here in a very long time..
4words. You are a legend!! 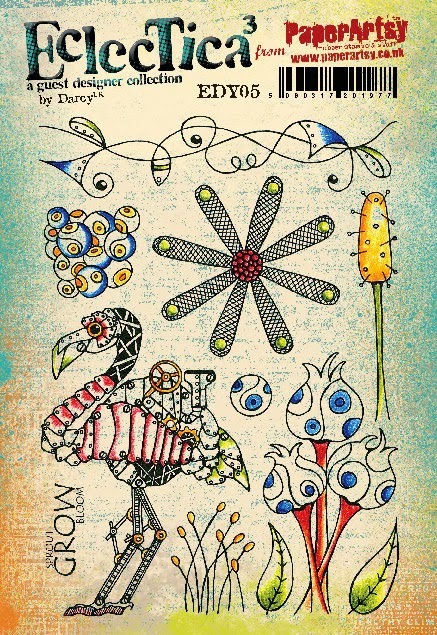 Amazing, Darcy - loving the stamps, for a start - but what a fantastic journal page.. like the square shape, too. May just have to get one!! 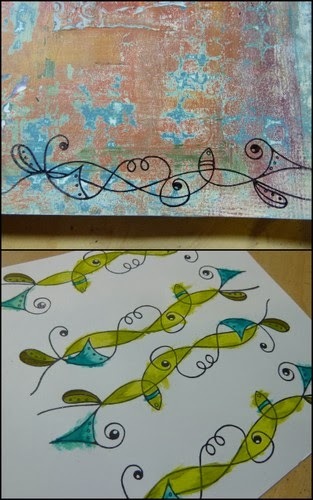 Glorious layers of colour - great tip about the stencil under the page, thank you! Fabulous to see your new stamps in action! Amazing page and I love your new stamps. Great tute! This is gorgeous Darcy! Your new stamps look fab too! That is an incredibly gorgeous page & I LOVE the new stamps. I'm delighted this is going to be a monthly feature. Stunning Darcy, fantastic challenge! Can't wait until Sept to get stamps now will have to get eralier! Darcy thank you so much for sharing this fantastic journal page. The techniques you demoed for us are outstanding especially the one with the stencil. You are such an inspiration. Big congrats on your new stamps cannot wait to see more. Wow! Fabulous pages and a great tutorial. I'll try to give some of these new techniques a go. Great new stamp release too! Congrats! Love your journal pages! Great tutorial. Thank you for sharing, I like the work whith grunge and layers very good technique! What a fab page! 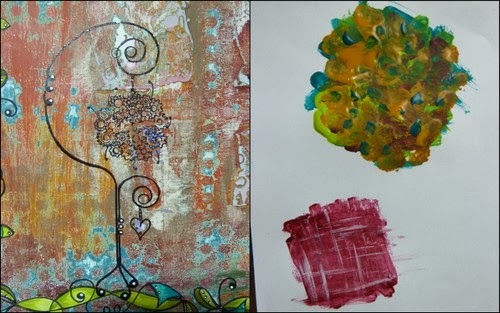 I am waiting for a couple of deliveries to arrive one with grunge paste and some paints the other with my first journal. Getting even more impatient with post to Shanghai! I want to play and I want to play with it all now. Now I think I may have to place another order for those favs stamps! 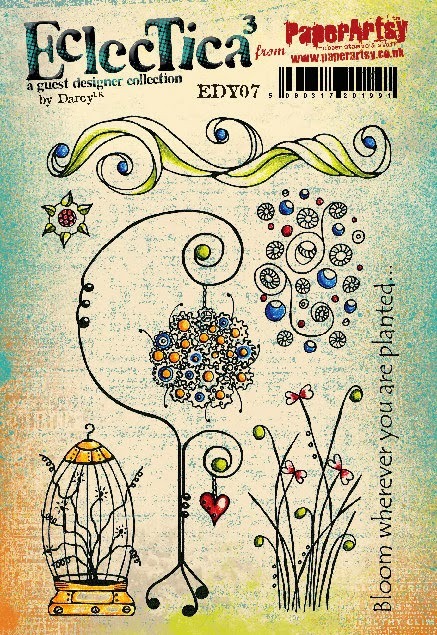 Thank you for such wonderful inspiration from everyone at PaperArtsy. wow, what a great tutorial! thanks for explaining all new techniques! and AJ page is absolutely gorgeous with adorable stamps! What fabulous ideas you have Darcy. I'm loving the look of your journal pages. I can't wait to try out those texture technique. Congratulations on your new gorgeous stamps! Wonderfully gungy and grungy Darcy and loving the new stamps. Wow Darcy, so many amazing ideas to explore! I love the rubbing thru the page with a stencil like that! Really want to try that one out. I have just ordered some new sketchbooks for Stevenage, so will have the pick of all shapes and sizes! Yeehaaa!